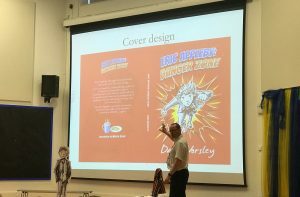 The new school year got off to a flying start with Danger Zone assemblies in two Blackpool schools: Devonshire Academy and Roseacre Academy. The children got to see all of the manuscripts from the first draft through to the final version. Never again will they complain when they have to edit their own work! 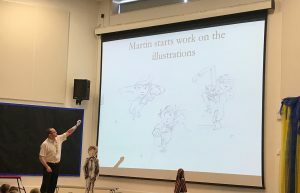 Martin provided drafts of his illustrations for the children to see and they even got to see how he creates Eric from scratch. He really is a talented fella! I couldn’t visit without putting on the storytelling waistcoat to share an Impossible Tale. At Devonshire, I shared ‘Pat On The Head’, which is a particularly stomach-churning story. At Roseacre, I told ‘Keep Your Hair On’. This is a story I haven’t performed many times, but it went down well and hopefully will become a real crowd pleaser in time to come. Two great visits with over 700 fantastic pupils in total. Thanks Miss Dean and Miss McIndoe for organising the sessions at your respective schools. I had an ace time!